Alan Wanamaker, working as a postdoctoral researcher from 2007 to 2009, was charged with beginning to compile a 1,000-year record of the marine climate for a spot in the North Atlantic just off the fjords and fishing villages of North Iceland. He was at Bangor University in Wales, working with James Scourse and Chris Richardson, professors in the School of Ocean Sciences. Before Wanamaker were thousands of clams, each specimen of Arctica islandica taken from 80 meters of seawater on the North Icelandic Shelf. Those clams - dead and alive, some able to live up to 500 years in the icy water - were the research group's sensors under the sea. Just like tree rings say a lot about growing seasons over time, annual growth increments in the shells can tell researchers a lot about ocean conditions over time. Wanamaker, now an Iowa State University associate professor of geological and atmospheric sciences, started building the marine archive by processing all those clams - painstaking lab work that involved sectioning shells, embedding shell slices in epoxy blocks, measuring down to a millionth of a meter, drilling samples, radiocarbon dating and determining oxygen isotopes. Then he'd eye cross sections of shells, looking for patterns, matching growth rings, finding overlaps, all with the goal of eventually lining up enough shells to build a master chronology of growth increments covering a millennium. After Wanamaker left Wales, Paul Butler, now a research lecturer at Bangor University, continued with the shell chronology and David Reynolds, now a postdoctoral research associate at Cardiff University in Wales, completed the isotope analysis. Wanamaker called it a real team effort. 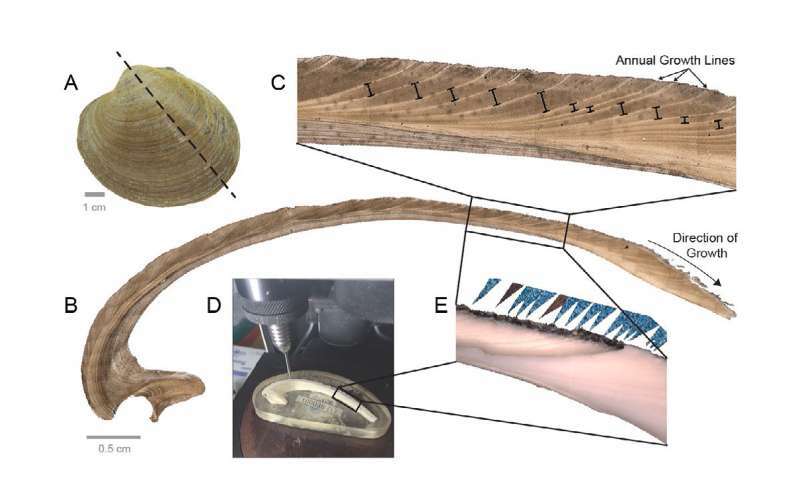 That open-access record, based on 10 years of work and analysis of nearly 1,500 isotope samples from dozens of clams, is now complete, Wanamaker and other researchers report in a paper just published online by the journal Nature Communications. Reynolds is the paper's lead author. Wanamaker, Scourse, Richardson, Butler and six others are co-authors. Grants from the United Kingdom's Natural Environment Research Council and the European Union supported the researchers' work. "Here we report a new 1,048-year precisely dated, annually resolved marine oxygen isotope record that spans the entirety of the last 1,000 years (AD 953-2000)," the researchers wrote in their paper. Isotopes are elements with varying numbers of neutrons. Heavier oxygen isotopes in the growth increments of shells are generally associated with colder, denser seawater; lighter isotopes are associated with warmer, less-dense seawater. A step toward climate prediction? Second, analysis of the annual record has allowed the researchers to study how temperature, density and circulation changes in the North Atlantic have affected changes in the broader climate system. The record "strongly indicates that ocean variability played an active role in driving the major pre-industrial climate variability of the past 1,000 years," the researchers wrote in their paper. That variability would include the warming of the Medieval Climate Anomaly from about A.D. 950 to 1250 and the cooling of Europe's Little Ice Age from about A.D. 1550 to 1850. The biggest discovery in the record so far? "The coolest thing that came out of this record is that during the first 800 years of data, ocean changes seemed to be leading atmospheric changes, or the changes were at least simultaneous," Wanamaker said. "But after 1800 and the industrial revolution, the atmosphere seemed to take complete control." The acceleration in atmospheric change compared to ocean change is "probably driven by the faster response of the atmosphere to the warming influence of greenhouse gases," the paper reports. Added Wanamaker: "We haven't seen anything like that in the last 1,000 years." Now that the 1,000-year marine record is complete and initial analyses have been made, Wanamaker said there's still work to do. 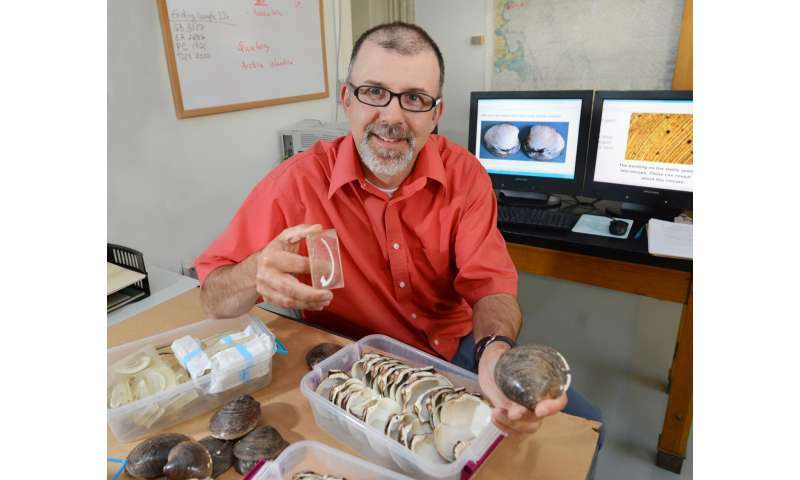 His own Iowa State research group is collecting and analyzing clam shells from waters off Maine and Norway with the goal of building marine climate records for other places in the ocean. He also said there's more to learn about the association between oceans and climate. The shell record of ocean conditions "provides a long-term baseline for the state of the North Atlantic coupled climate system," the researchers wrote in their paper, "and demonstrates that the role played by the ocean in naturally forced climate variability should be a key focus if we are to realize the societally crucial step forward in near-term climate prediction." And so, all those years of sorting and studying clam shells were worth the time and tedium, Wanamaker said. "It's really gratifying to see this come to fruition." Climate history will quell the false claims made by the AGW crowd. A failure to acknowledge the natural trends and extraordinary factors that influence climate results in inaccurate assumptions regarding future climate. I am more worried about a large volcanic eruption, crashing Taurine bolide, or Carrington solar event than CO2 levels of 400 ppm. As I recall, the Eocene had CO2 level 5 times greater. This research is specifically about understanding the climate and natural trends. The scientists are out there, actually doing this hard work, and you're pretending that you know something they don't. Yeesh. And where were humans during the Eocene? That has to be one of the most obtuse, bone-headed and illogical statements I've ever seen, even on this site. Sheesh...of course we weren't there because we hadn't evolved yet. Duh-uh. There was virtually no ice at either pole, so with all that CO2 forcing temperatures to Venus-like levels, it must have wiped out all life on earth, right? No, in fact, it seems like the climate would have been just fine for humans in the Eocene. Except for the cooling periods. The work discussed here is a wonderful example of how totally wrong you are. Your response is a "wonderful" example of how totally retarded you are.